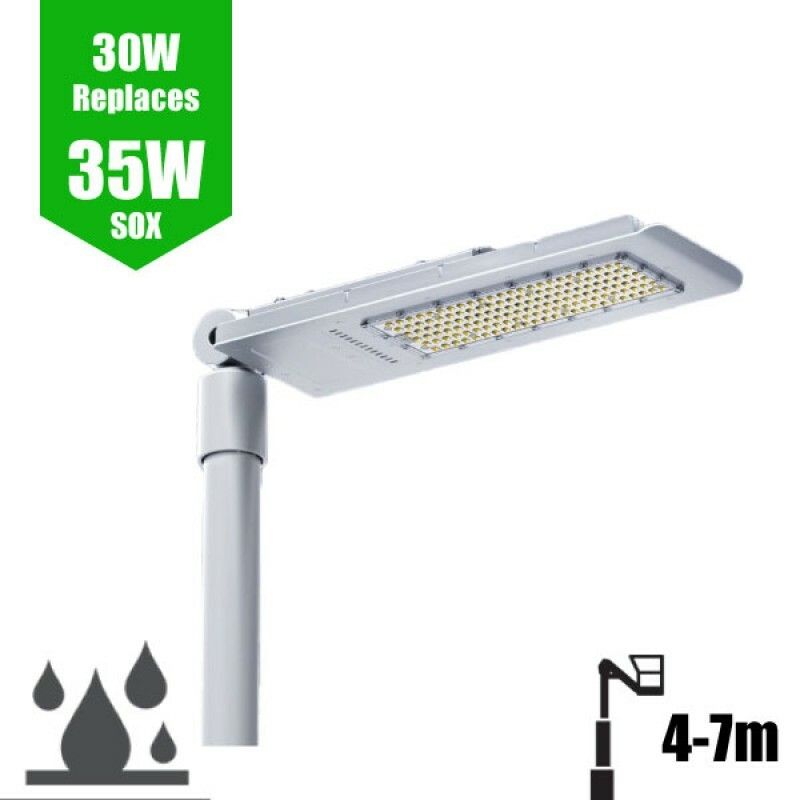 [65° x 135°] 30W/3,200lm LED Street Lighting series post-top is a minimalistic slimline LED street light luminaire designed for column/post mounting at heights of 4 - 7m. IP67 design for exterior environments, with a low-profile, sleek silver anodised aluminium body for harsh weather environments, luminaire is for urban applications such as car-parks, pathways and pedestrian areas. PMMA optic lens ensures a high degree of uniformity across a range of spaces and reduced light spillage, thus further enhancing this 107lm/W luminaire to give optimum lux levels throughout. Furthermore, street light luminaire compatiable with standard mains photocells. Additional benefits of LED street lights as well as +50,000hour maintenance free performance, include minimal disturbance to nocturnal wildelife to the lack of UV/IR spectrum associated with LED photometric characteristics. 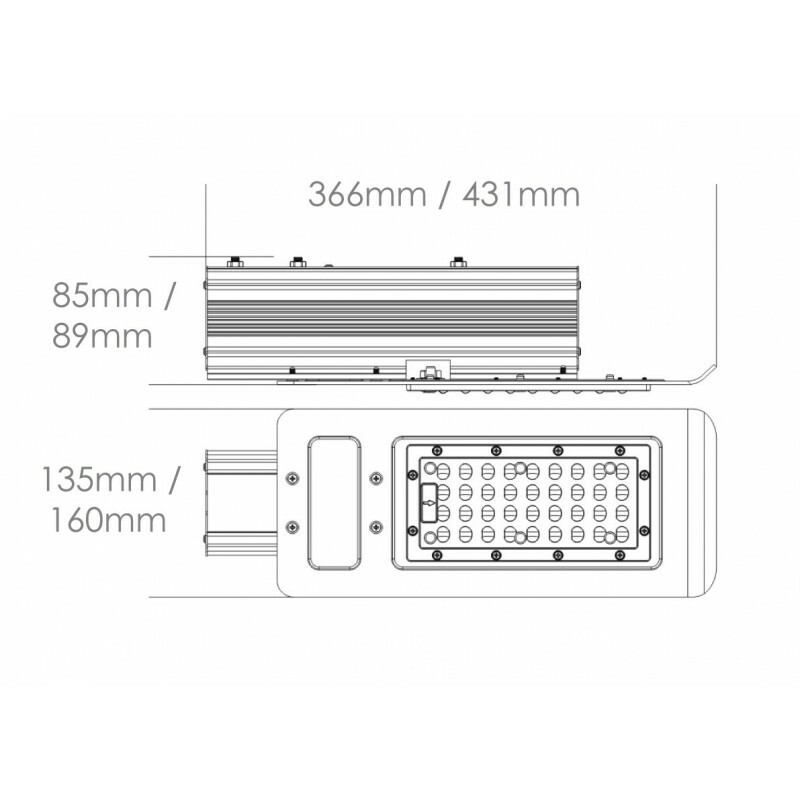 LED Street Light unit includes box both cover plates to suit 40mm and 60mm side entry as standard. Post and bracket not included. Furthermore, compatible with part number LSTPST-A, adjustable street light adaptor for 60-70mm columns which can also be used for angle adjustment of luminaire around 120 ̊. 4ft / 1200mm [1.2m] Twin LED Strip LightA revolutionary LED replacement to replace complete non-corr..